Our Villu Villa hosts were up at 6am to farewell us with a packed breakfast of sandwiches and fruit. We were determined to make the most of the cool early morning hours. 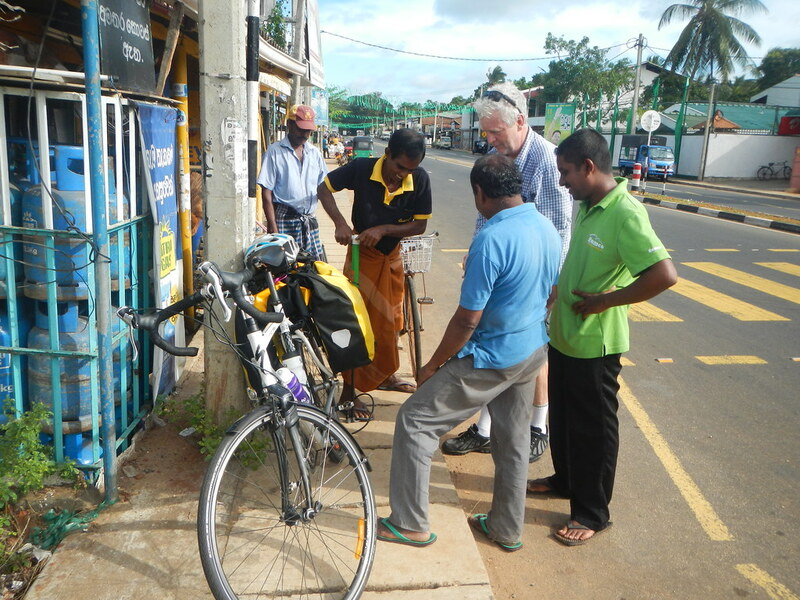 The problem of the bike pump re-emerged as it transpired that the one we bought in Negombo cannot inflate our tyres, and Ian’s rear tyre needed some air. Aaargh! A lycra-clad Sri Lankan racing cyclist came past, but he had no pump. We rode past lakes with fishing boats and distant cloud covered hills. We breakfasted under an umbrella to avoid a light shower of rain. Then we arrived in the town of Maradankadawalla and got the pump problem solved. From the depths of a hardware shop, narrow and dark and packed with stock, emerged a pump with the required adaptor and several Sri Lankan men ready to help. We bought their pump ($3.50) and donated ours. 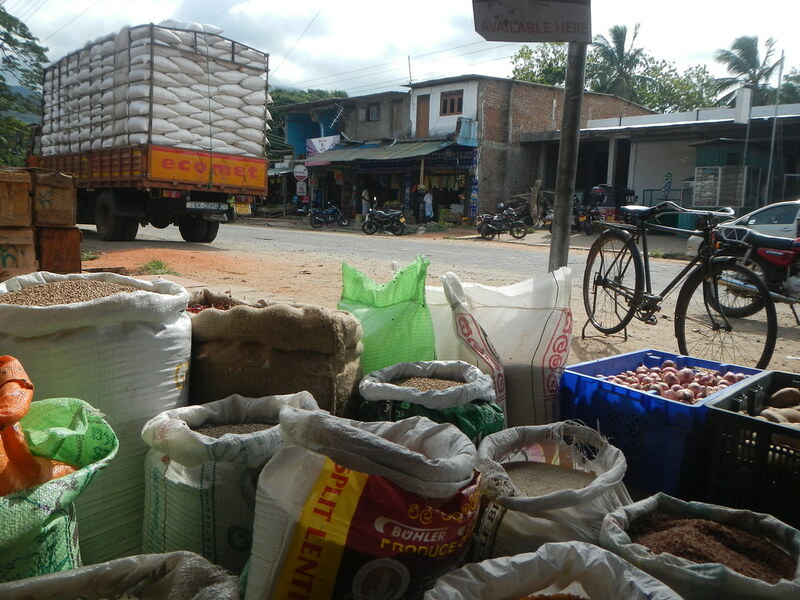 The small towns we see are lively with many small shops selling fruit and vegetables, rice, clothing, mobile phone services, bicycles, motor bikes and many other things. We have discovered that ‘hotel’ can also mean a small food shop selling drinks and snacks. There are no supermarkets nor fast food outlets. Along the roadside between towns there are many stalls and little shops selling fruit, vegetables, coconuts and drinks. Tea is served with warm milk. Everything is very cheap. We have seen stupas, Hindu shrines and small mosques today. We passed our first mountain, Ritigala, a 766m forested peak with exposed granite sheets and the ruins of an ancient monastery. We are now in Inamaluwa, near Sigiriya Rock, a major tourist attraction. There is a huge amount of accommodation, restaurants, tours, tuk tuk drivers, jeep tours for elephant viewing in nearby national parks and, of course, more tourists than we have encountered elsewhere. We have now seen two elephants, both in less than ideal circumstances of captivity. Apparently there are wild elephants around here so we are advised not to go out on the road at night. This entry was posted on 12 September 2015 at 3:07 pm and is filed under Sri Lanka. You can follow any responses to this entry through the RSS 2.0 feed. You can leave a response, or trackback from your own site. Thank you Herman, the bicycle riders of Sri Lanka need this! Hello Ros, people v friendly and helpful, English is spoken by many and children learn it at school. We have learnt to say good morning and thank you in Sinhalese – we’re slow learners!